If you're an avid pop-punk follower, you'll probably know that Florida quintet Mayday Parade have been around for a while now, having released their debut EP all the way back in 2005 and currently being out there with their third LP, this time titled merely "Mayday Parade". Normally I'd consider myself an avid pop-punk follower, but perhaps not avid enough, because I've honestly only been vaguely aware of this band's career trajectory. From the world around me I seem to get that they're one of the more sappy and cheesy acts in the genre, and hence not worth too much of anyone's time, yet the few times I've heard material by them, I've gotten the impression that there might be more to them than that. 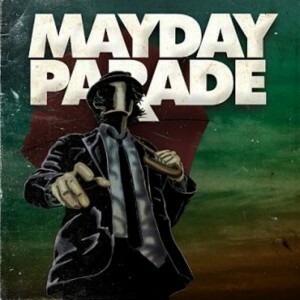 Hence I've been giving this "Mayday Parade" album some curious spins lately, and I believe that I'm ready to come out with an at least somewhat worthy analysis. 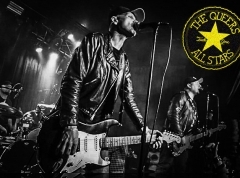 The band is indeed quite traditionally pop/punk/rock and in typical American fashion they try to bring uplifting, emotional anthems to the good rock-hungry people. Opener "Oh Well, Oh Well" does its job perfectly, introducing new listeners to the band's sound, which is characterized by a completely conventional setup in terms of instruments, songwriting and singing, all aimed uniformly at producing songs that soar and make the listeners' (young?) hearts soar with them. To their credit, Mayday Parade do quite well at just this, consistently establishing a convincingly sentimental mood, mostly through the use of a solid understanding of songstructure and the spirited vocals of singer/keyboardist Derek Sanders. On the flipside however, one very quickly starts to suspect the band of being a one trick pony, with each song on "Mayday Parade" sounding disturbingly similar to the last one. It doesn't seem to matter whether the tempo is upped or slowed, or which perspective is taken in the lyrics - most of which seem to deal with the terribly difficulties of young romance. It all sounds completely the same. Now, it could be I'm just too used to all kinds of gimmick samples and exotic vocal arrangements, but the fact is that Mayday Parade's biggest problem right now is that the songs on their self-titled sound much too samey and formulaic. It's like they're channeling the exact same starry-eyed emotion regardless of what song they're singing, and the lack of variety eventually reduces the album to one that feels like it has a lot of filler and too few real stand-out moments. Of course this is likely more than good enough to add a few new songs to the band's setlist and keep their career rolling, but really, for a band this poppy it's disappointing that the first handful of highlights isn't jumping off the record already after a few spins. Compared to recent efforts by similar bands, it indeed seems evident that Mayday Parade are decisively middle of the pack. They're not quite as insufferable as the likes of We The Kings and Boys Like Girls, yet they're also not on the level with the average material from bands like All Time Low or You Me At Six. Moreover, don't even mention them in the same sentence as genre progenitors like Jimmy Eat World and Relient K.